DALY CITY, Calif. — Lake Merced Golf Club hosted the Dragons’ third tournament of the season. 26 players entered the popular annual tournament, and other Dragons also joined the post tourney dinner. In typical San Francisco-like weather, all players started with a few layers, and were mostly down to polos for the afternoon shotgun start. You would think the course had softened two months after hosting the LPGA Mediheal Championship in April. Even with ideal scoring conditions, the course was a tough (but fair) test of golf, as no one broke net par. Coming into the tournament, all eyes were on Dragon Cup Leaders, John Park and Fan Li. Dominating the B Flight the first two tournaments, they were 1st and 2nd in the standings. They were the favorites to have strong finishes at the Lake Merced tournament, especially Park, a member at LMGC. It turned to be US Open-like scoring for both the A & B Flights. In the A Flight, Steve Tsang’s net 74 placed him 4th after a card off with Brian Fong. Three players shot an impressive net 73. Tournament Director, Peter Lyu, continued his quest for the Dragon Cup, shooting net 73, to finish 3rd after cardoff. Rookie Chester Siaotook home 1st place in a card-off over John Chu. Down in the B Flight, it was all about survival. Karen “Mother of Dragons” Fong, “hung around” long enough to win 1st place with a net 74. Dr. Fong has been perennially in the mix and finally finished down the stretch. Rob Dang’s net 76 was good for 2nd place over Jonathan Wong’s net 76 by cardoff. Rookie Shirley Lin nabbed 4th place with her net 76 for a nice debut showing. Fan Li and John Park finished middle of the pack to create lots of drama in the season long points race or the Dragon’s Cup. As per tradition, the Lake Merced tournament members dinner served as the Weekender Team Draft. This year, the Club is headed to Santa Barbara to play the Sandpiper and Ranch San Marcos tracks. In Year Two of the budding rivalry between Team Red Captain Mike “LeBron” Lum and Team Black Captain Davis “Steph” Lee, Lum got the first pick. 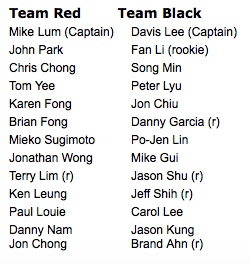 Lum picked Rookie of the Year and Dragon Cup leader John Park without hesitation. Fan Li promised Captain Lee he would perform better and guaranteed to take down Park, so he was picked 2nd overall. Usually the lower handicaps are always picked first, but in the new age of analytics and matchups, the higher variances players were the most coveted for this team event. At least that’s what the egg-headed Capt. Lee appears to believe. Meanwhile, for Capt. Lum, blood is thicker than water, as he took the Fong and the Chong siblings. Capt. Lee is rollign the dice with five Dragons freshmen on his side, while Capt. Lum took grizzled veterans like Tom Yee, Paul Loui and Mieko Sugimoto. The captains will be making their Best Ball pairings in the coming days, and as per recent tradition, the Sunday singles will be picked President Cup style on Saturday night at the members dinner. Possible late entries are being finalized by the Board, and information regarding the Saturday Night Club Dinner will be coming from director Jeff Yee. For those heading down the coast early, stayed tuned as well for the Glenn Annie outing news from Mike Gui.